Benchmarks are essential tools for testing and comparing PC performance. But manually benchmarking more than a few systems at a time quickly becomes time-consuming. And reporting is a challenge if you have to collect result files in person. Testdriver makes benchmark automation easy. With Testdriver, you don't have to be physically present at the PCs you are testing. 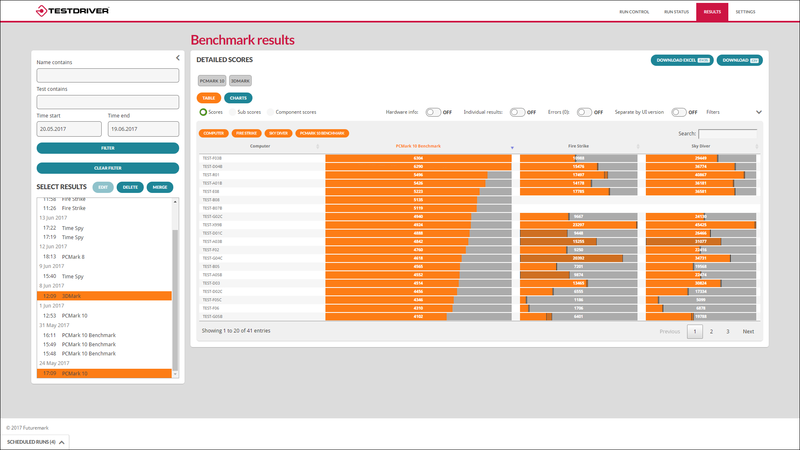 You can deploy and run benchmarks on any PC in your organisation from one central control console. You can schedule benchmark runs, check the running status, and view benchmark results from any device on your network. Testdriver handles the remote installation and running of the benchmarks and automatically returns the results to a central database. With its powerful features and options, Testdriver makes it easy to benchmark hundreds, even thousands of PCs at a time. Save your company time and money with easy benchmark automation. Set up, schedule, and run benchmarks on any PC connected to your network. Testdriver supports an unlimited number of client systems and runs. Collect and store all benchmark results in one central database automatically. Powerful built-in reporting, charts, and data analysis. Supports UL benchmarks: PCMark 10, PCMark 8, 3DMark, 3DMark 11 & VRMark. Deploy and run third-party benchmarks, applications, and system updates. Simple to setup and use, Testdriver runs on any Windows PC or server. Testdriver puts you in control with a convenient browser-based console that makes benchmark automation easy. You can remotely install and run benchmarks on any PC on your network. You can set up and schedule benchmark runs on an unlimited number of systems. Testdriver can benchmark hundreds, even thousands, of client systems simultaneously. The control console provides easy status monitoring and progress tracking for each system under test from any device on your network. Testdriver automatically collects the results from each system and stores them in a central database for easy access and reporting. With Testdriver, you can remotely install and run benchmarks over your network. You don't need to be physically present at the systems under test. The Testdriver client component is the only part that is installed manually on the clients. Once installed, it manages all benchmark installs and uninstalls. You can deploy new versions of Futuremark SystemInfo and the Testdriver client itself through the Admin Tool, which will trigger automatic updates on the client machines. Testdriver can also be used to deploy new drivers and other system updates. 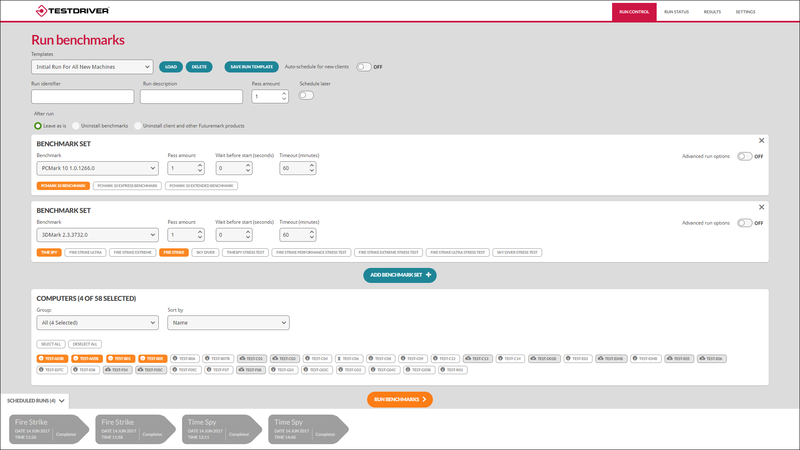 Testdriver offers flexible targeting and control. Define sets of PCs, by department, for example. Define sets of benchmarks, from single workloads to multiple passes across several tests. Then schedule runs when it is convenient for you and your users. Testdriver supports an unlimited number of system sets, benchmark groups and scheduled runs. Testdriver supports industry standard benchmarks from UL including PCMark 10, PCMark 8, 3DMark, and VRMark. You can also run and automate third party benchmarks and software tools. Testdriver automatically collects and stores all your benchmark results in one central database. 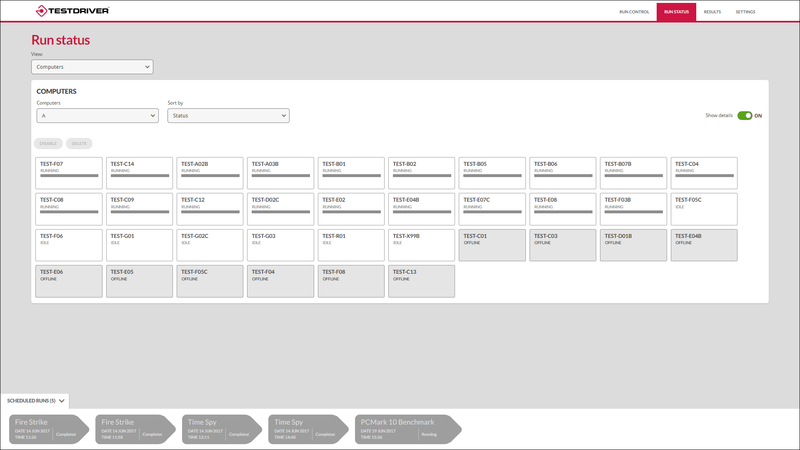 You can explore the database with Testdriver's powerful built-in reporting and result management or use your own business intelligence software and tools. Testdriver offers flexible search, sort, and filters to help you find trends and anomalies in your benchmark results. Explore your benchmark results in print-friendly tables or with interactive charting tools. Save PDF reports or export your data to Microsoft Excel or CSV files for further analysis. With Testdriver, IT administrators can replace costly and time-consuming field inspections with centrally managed remote testing and monitoring. You can manage your company's device assets and identify poorly performing systems. Testdriver can help you avoid costly wastage by replacing systems only when needed rather than following a fixed time-based schedule. You can evaluate the impact of software updates on a select set of systems before rolling the update to all users. Benchmark testing is an essential tool for Production Floor Operations. With Testdriver, device manufacturers can dramatically reduce the amount of manual work required to test devices coming off the production line. Testdriver automates your benchmarking, which saves time, reduces errors, improves reporting, and ensures quality. Testdriver also provides easy database access to historical test data allowing your staff to quickly identify trends and remedy problems. When a company buys PCs in large volumes, a small saving on each machine can cut the total cost by tens of thousands of dollars. But writing vendor-neutral tenders that precisely define performance requirements is a major challenge for purchasers. Testdriver helps you specify PC performance with benchmark scores. This makes it easy to compare tenders. With Testdriver, you'll avoid overspending on overspecified PCs, while making savings from fair and open competition between vendors. Annual single-seat license included with PCMark 10 Professional Edition. Unlimited clients and runs but limited to one run on one client at a time. Full database and result export support. Testdriver annual license. Benchmark licenses purchased separately. Support for third-party benchmarks, applications, and system updates. Unlimited number of clients per run. Unlimited number of scheduled runs. Unlimited number of concurrent runs. Priority support over email and telephone. Client requirements vary by benchmark.